I apologize to the clerk at the VA that I just went off on, but folks let’s get the BIG picture here. OUR veterans should NOT have to be repeatedly subjected to the WHIMS of each new doctor that has no regard for the pain of the patient or the costs to him and his family emotionally and financially while he is repeatedly put on the back burner and subjected to the same tests and assessments again and again without actually receiving the necessary treatments. HELP??? 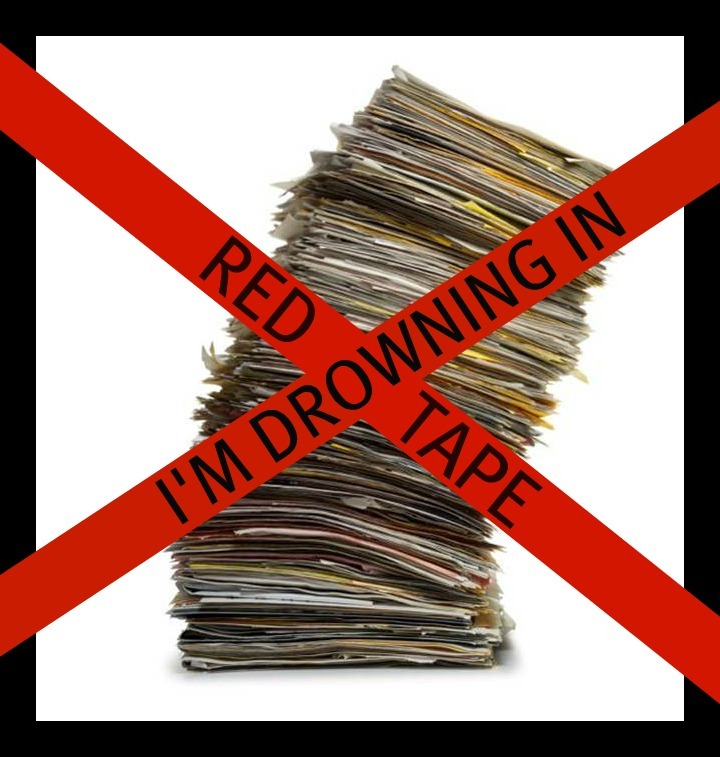 DROWNING IN RED TAPE!!! I’m screaming, can’t you hear me? This vicious circle of red tape and apathetic government employees needs to end!!!!!!! You may laugh at my picture above, but all kidding aside our pile of paperwork is HUGE!!!! The following story is just one example of a standard life within the VA system. Did you know that the VA governmental computers are not linked? There are a precious few who have the password” to see past records, but they are so far and few between that you, the soldier or military spouse are best armed by maintaining your own notes. Be sure to include dates, names, length of time on hold, how many times you are disconnected or transferred and who said what. If you move, all the records from the MTF (military treatment facility) or VA Medical Center do not really follow you, so be sure to stop by and always get your release of records so you can read and see what is right and wrong. If there is wrong information stop by and see the patient advocate to make the correction. Anyway, during that process we were told by the Registration Clerk that an evaluative appointment would be made with my husband’s primary care doctor and he would have an appointment in the next 3-4 weeks. We waited patiently for the appointment time to be mailed to us. After 4 weeks, it wasn’t here. After 5 weeks, it still wasn’t here. After 6 weeks I was livid. I called the VA and a week later, 6 hours of hold time, 4 times being cut off/hung up on, 12 transfers, 12 different answers and I finally spoke with the scheduling clerk for my husband’s doctor. Cory (or attitude boy as I call him – the poster boy for apathetic I don’t really give a crap) proceeded to tell me that there are only 2 doctors at this facility and that my husband was 200 on the waiting list to see a doctor and that he would eventually get an appointment. After some heated discussion I was able to get him fit in for an appointment 2 months from now. Think about it, if they had made the appointment as promised, when promised, he’d be seeing the doctor next week instead of in May. I then went to state our complaint to the patient advocate who took our name and number and promised to get back to me later that afternoon (last Thursday). He never called. We stopped by his office today and he didn’t remember ever speaking with me. While he was cordial and sympathized with our concerns on the breakdown in the system, he said there really wasn’t anything he could do. He did tell us that the reason there were only 2 doctors was that the doctors who came to this area rarely stayed past 6 months because the “wives” didn’t like the ruralness of the area, lack of shopping facilities and the lack of “decent” restaurants. Really, I can’t make this stuff up as well as the real stuff. He then referred us to a different office for a reevaluation of a problem hubby is having. When we got there we found that they were closed and only opened when there was a scheduled appointment. Really? how do you get a scheduled appointment? No one knew – there was literally NO ONE in sight of this window! From there we went to the pharmacy. A line of 20 people with just as many already sitting and waiting. Many had been in line “forever”, their words, not mine, so we opted to wait for the prescriptions to be mailed. Keep in mind that they were supposedly mailed on the 8th, but have yet to arrive 10 miles away. During my cancer ordeal hubby was at my side continually, but so much so that he let his own care slide. Now that I’m getting better, I plan to make it my mission to get him the care he needs and the red tape cut and cleaned up for the VA claim issues. I’ve heard many times that the VA is just waiting for the Vietnam veterans to die so they don’t have deal with them. While I hope this statement isn’t really true, I have to say that the amount of red tape paperwork generated by the VA to do the simplest of tasks is overwhelming and ridiculous and I can see why many veterans would give up hope of ever solving their claims. We tried to contact a service officer also, but they work out of a different office. The 2 veterans manning the front desk at the medical center had differing advice – one said you must call first for an appointment while the other said it was walk in only. They gave me a slip of paper with a phone number and hours of M-T 1:30-4PM typed on it. I called the phone number and they said if you MUST leave a message make it short and DO NOT leave repeat messages, they will get back to your eventually otherwise show up at noon, take a number and wait. They will begin taking you in order at 1:30PM. REALLY???? I want a job where I can work 2 1/2 hours a day, 4 days a week and treat those I serve as cattle!